According to the Grand Comics Database, “Roy B. Nyles” was the anagram pseudonym of Loy Byrnes. Who’s Who of American Comic Strip Producers said Byrnes was born 1906 in Jersey City, New Jersey. The 1940 U.S. Federal Census, which recorded Byrnes’ name as “Lloyd Burns”, said he was 34 years old and a New York-born cartoonist. At the time, Byrnes resided with fellow cartoonist Gus Jud (Little Dave) and Jud’s parents at 182-17 91 Avenue in Queens, New York. Byrnes’ highest level of education was the eighth grade. Maybe the name Loy was short for Aloysius or Loyal. Byrnes has not yet been found in the 1910, 1920 and 1930 censuses. A World War II draft card or other military record for him has not been found. The New Yorker, September 14, 1929, published Byrnes only cartoon for that magazine. In 1930, Byrnes illustrated the book, The Adventures of a Brownie. According to American Newspaper Comics (2012), Byrnes took over Gus Edson’s Streaky, from 1937 to May 21, 1939, and its topper, Dopey Dildock, from November 1935 to 1939. As Roy B. Nyles, Byrnes produced the strip Silly Willie for Syndicated Features. The strip ran from July 13, 1936 to March 8, 1937. 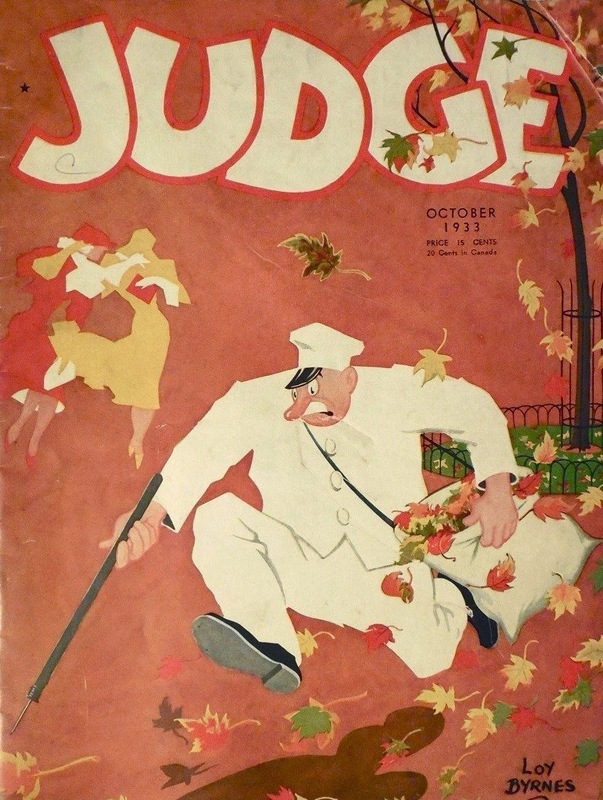 It later saw print in the comic book, Best Comics, numbers 1, 2, 3 and 4, from November 1939 to February 1940. 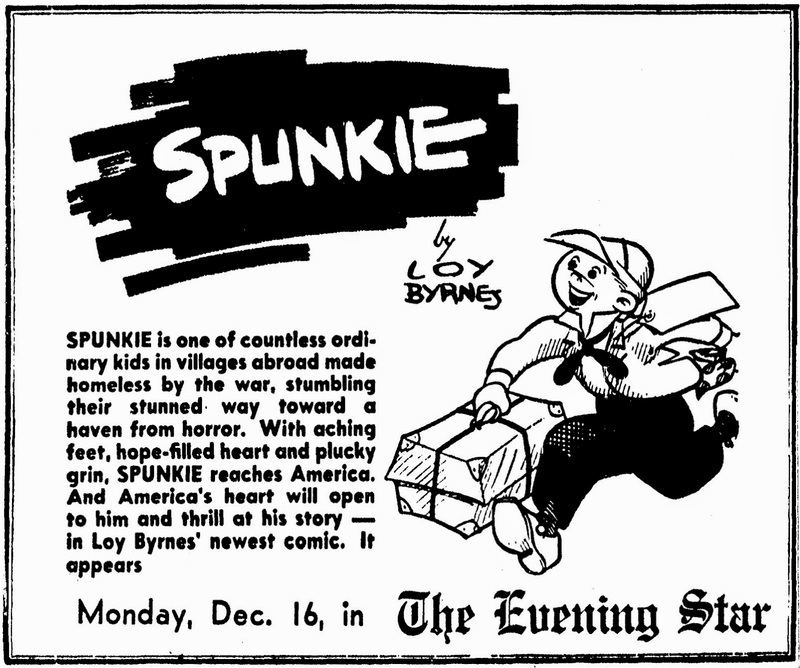 Byrnes’ comic strip Spunkie ran from December 16, 1940 to March 21, 1942. Also in the 1940s, he assisted on Nancy. Byrnes, Loy. * 7287-7289 Buzz Sawyer: Accepts an assignment, 2.— One chosen, 1. — Receives his secret code card, 3. © 1 c. each July 26, 1940 ; G 36210-36212. 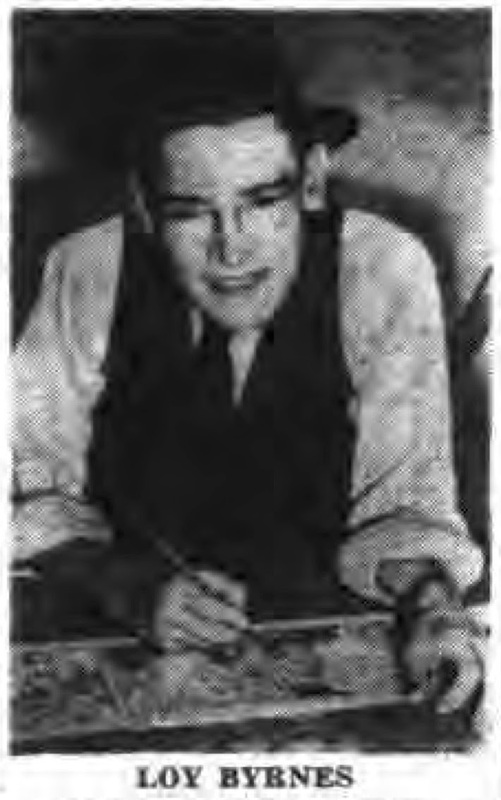 According to the New York Times, January 26, 1942, Byrnes was one of a hundred cartoonists who contributed posters to United China Relief’s exhibition at the Grand Central Art Galleries in the Hotel Gotham. Byrnes’ pantomime strip, Tootsie, appeared in Good Housekeeping magazine; it can viewed in the following issues: July 1945, October 1945, November 1945, and January 1946. 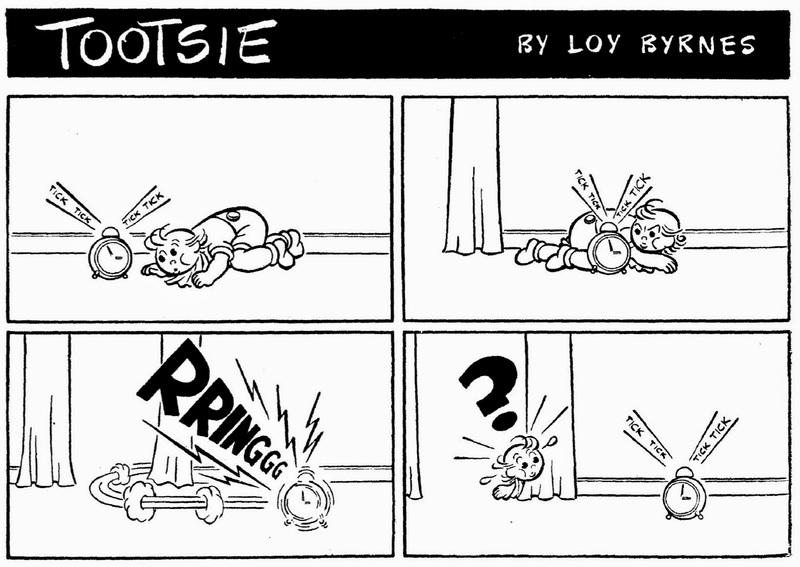 The Post, June 2, 1945, touted Byrnes’ new comic strip. For 10 years Loy Byrnes collected notes and ideas and drew sketches for a comic strip. He had already found the appropriate title, “Punchy and Judy.” At last he decided he had hammered out enough work of the pay-dirt variety. The result is a comic “comic” strip, minus blood, thunder and gunfire, destined for laughs instead of sobs. Punchy is a sparring partner in a gymnasium; Judy is a chocolate-dipper who excels at applying curlycues to the iced tops of bon-bons. Together they form a romantic comedy team whose adventures start in The Post Monday June 4. A little man with a sardonic wit, Loy Byrnes at 39 has had almost 20 years of cartoon experience. There was no preliminary period of hesitation when he chose a career. Decorating school blackboards led with unswerving logic to a job in the art department of the old New York World. He was just 14 when he hit the Sunday section with a children’s feature that ran for almost three years. Under pressure Byrnes admits that he once studied briefly at the Art Students League, has turned out a number of successful features, is a bachelor, belongs to the Society of Illustrators and is a member of the Museum of Modern Art. When at work Byrnes whistles softly to himself. The harder the thinking, the more intricate the tune. In the groove he can, he boasts, rip off hot licks that are the everlasting envy of his less musically gifted contemporaries. The Post, November 7, 1945, noted a recent gathering of cartoonists. At the Shor shindig a book of beautiful woodland scenes contributed by the assembled artists was presented to Bugs after some salty speeches by E. Sims Campbell, Stan McGovern, Loy Byrnes, Milt Caniff and Cas Adams. Thirteen days later, Byrnes passed away November 20, 1945, in New York City. His death was reported the same day in the Post. Loy Byrnes, cartoonist of the Punch and Judy strip in The Post, died today in Mt. Sinai Hospital at the age of 40. Funeral services will be held tomorrow at 10 a.m. at the Joseph McAllister Funeral Parlor, 202 E. 39th St., followed by a mass of requiem at St. Agnes Church, 141 E. 43d St. Burial will be in Holy Name Cemetery, Jersey City. Byrnes is survived by an aunt, Mrs. Nellie Mitchell, of Teaneck. He had a brother Robert Byrnes. His dad died when he was young--in 1913 from consumption-after a 5 year battle with it.